One of the fantastic things about having a summer baby is that you have TONS of choices when it comes to a birthday party. Initially, we were thinking about doing a "Moustache Bash" for his party, but it was very very similar to my Little Man babyshower, so we decided to go a different route. After looking around on Pinterest, I fell in love with another idea - Cooper's Crab Shack! So perfect for a summer birthday! I talked to Gigi about hosting it at her house and turning it into a pool party, and she and Poppy were totally on board! There was a LOT of prep that went into this party! First, my brother-in-law did an AMAZING job both taking the pictures for, and making the invitations for Cooper's party. I LOVE how they turned out. Here's the final result!! I bought this "C" at Hobby Lobby and then spray painted it red to match the theme. After this party, I am officially obsessed with spray paint and I keep trying to think of reasons to use it - haha. This "C" ended up going on the present table. Grammy made Cooper's shirt and bib for the party for me and they turned out absolutely perfect!!! Her etsy shop is here. And here's what it looked like as we started to put things together!! The theme was mostly red and white with just a little bit of navy thrown in. 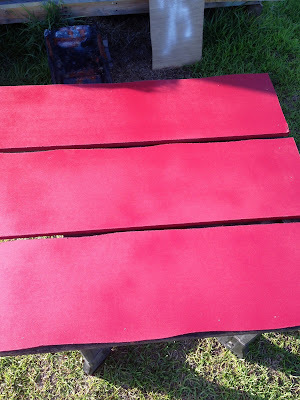 This is the sign that I showed you how we made earlier. I ordered the banner from Amazon (here) and was impressed with how good it was considering how cheep it was. The balloons I just got from Hobby Lobby, as well as the sticks that are holding them up. My sister found this net at a party store in Atlanta, and it made a perfect touch around the sign. I knew I wanted to hang paper lanterns all around the outside. We had some at LL's Tangled party, and they added such a cute touch. I also knew that I wanted to find them much cheaper. I got the lanterns for LL's party at Hobby Lobby and they were about $10 for three. Ummm...no. Thanks to Pinterest, I found that you can order them for suuuuuper cheap at justartifacts.com. 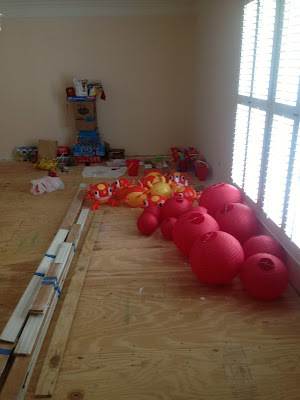 I ended up getting 12 lanterns (and shipping) for about $21. These crab beach balls were another find by my sister. I found them on amazon (here), but they were $5 each. At a party store in Atlanta, they were about $2 each. We had 12 of these blown up and floating in the pool, and they were part of the kids' favors. As each kid left, they picked a crab to take with them! I really wanted to do a banner timeline of Cooper's first year, especially since I have all of the adorable pictures of Cooper with his monthly stickers. 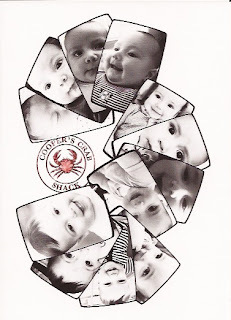 While looking around on etsy, I found these super cute crab clips with the months on them (here)! I went to Hobby Lobby and found this burlap ribbon in the Christmas section (??) and just hot glued the clips on there! It went PERFECTLY with the nautical theme!! I also ordered a party pack printable from TomKat studio's on etsy (here). It had a lot of really cute printables that I used all around the party. This is a banner that says "Happy Birthday". We had these balloons placed all around the perimeter of the pool. Again, I got the balloons and stick holders from Hobby Lobby for suuuuuper cheap. This was the entrance to the backyard. 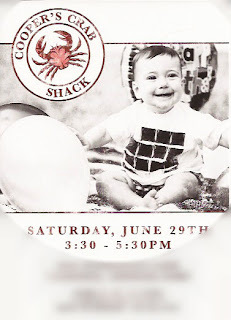 The banner is the same one that I used above the Cooper's Crab Shack sign. The Welcome sign is part of the TomKat Studio printable pack. This cake idea I found on Pinterest (again - TomKat Studio) was kind of the inspiration for the entire party. Luckily, LL's teacher this year at preschool does an AMAZING job and making cakes. I talked to her, and she made Cooper's smash cake to match this one! Cooper's smash cake - Mrs. Heather did a PERFECT job!! This topper was part of my printable. This was the food table set up. We had the timeline, the lanterns, another net, and a sign my sister made. My sister just whipped up this little diddy the night before the party. Isn't she the best?? These were also on the food table. I found them super cheap on Amazon (here). It was a box of 144 for about $6! This was the second part of the favors (after the crab beach ball). We found these red beach buckets for $1 each (and they were a BEAST to find! We could find every color under the sun but red!! Who knew??). 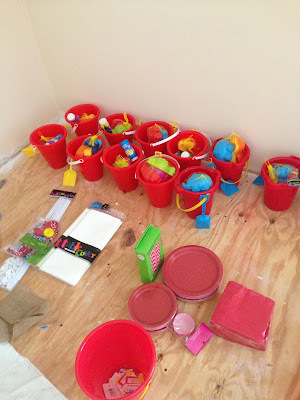 Inside, we filled them with beach toys (the $1 spot at target), some bubbles ($1 for 3 at the dollar store), and a whistle (party store in the ATL). Then, I just took a huge marker and wrote everyone's name on the bucket. I also go this "I am 1" banner for the front of Cooper's highchair for when he did his smash cake. This was another etsy find (here)! Instead of doing a huge cake, we just made cupcakes for everyone. I found the red liner at Hobby Lobby, and the toppers are part of my printable pack. You can also sort of see here the crab confetti that was all over the table. That was another etsy find (here)! This really was the MOST FUN party to plan ever! Up next: the party itself! Great details!! What did we do before Etsy... Well Pinterest really! Gosh!